Mindfulness is the practice of being aware of and living deeply in the present moment. A couple of years ago, I started searching for "moving meditation", and discovered the Taoist Tai Chi Society. I joined the Portland Center and finished the beginning training in June 2013, were I learned the 108-move set as taught by Master Moy Lin Shin. I now bike to the center several times a week to attend classes. It is such a pleasure to practice in this beautiful center, and I especially love the experience of moving through the set in silence with the group in each class. Please feel free to contact me if you would like more information about Taoist Tai Chi. The Portland Community of Mindful Living has several sanghas that practice in the tradition of Vietnamese Zen Master, poet, and peace activist Thich Nhat Hanh. I've been a member of the Joyful Refuge Sangha since 2000. We meet on Monday nights, at the Friends Meeting House, 4312 SE Stark Street in Portland. The room opens at 7:00pm, with meditation starting at 7:15pm. We have sitting and walking meditation, singing, readings (usually from books by Thich Nhat Hanh), and sharing. Our practice ends at 9:00pm. For more information, please feel free to contact me. Thich Nhat Hanh currently lives in Plum Village, a Buddhist training monastery he founded in France. He is the author of more than 35 books in English, including Teachings on Love and For A Future To Be Possible. I find his particular words and the way he expresses his beliefs very touching and inspiring. Many of his books are published by Parallax Press. The Mindfulness Bell is a journal of the art of mindful living. The following list of aspirations was developed by Oregon Dharma Teacher Jerry Braza and Blaze Compton. Several colleges and universities are beginning to use these points to create dialogue with students on how they can live their lives more deeply and mindfully. These aspirations offer a guiding light and encouragement to look deeply at ourselves and our interactions with the world. They are based on the Mindfulness Trainings found in the Plum Village Chanting and Recitation Book, compiled by Thich Nhat Hanh and the Monks and Nuns of Plum Village, published by Parallax Press in 2000. 1. I aspire to live more fully in the present moment, thus deepening my relationships with all beings. 2. I aspire to develop respect for and extend compassion to all living beings. 3. I aspire to embrace a livelihood that supports the well-being of my society and the environment. 4. I aspire to cultivate generosity by sharing my time, energy, and resources with those in need. 5. I aspire to protect the safety and the integrity of all relationships by upholding trust and fidelity as unifying principles between couples, in families, and in society. 6. I aspire to listen deeply and to speak lovingly to support others during times of suffering and of joy. 7. I aspire to consume in ways that promote physical and emotional well-being for myself, my family, and my society. 8. I aspire to generate calmness and peace in myself and in my environment by the daily practice of deep inner reflection, meditation, and/or contemplation. 9. I aspire to open my mind to all cultures, faiths, and ethnicities, thus nurturing my understanding of all beings. 10. I aspire to be a peacemaker by practicing non-violent means to solve problems and by being mindful in times of conflict. 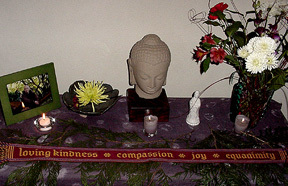 At Joyful Refuge Sangha in Portland, we recite the five mindfulness trainings on the first Monday of each month. The mindfulness trainings are found in the Plum Village Chanting and Recitation Book, compiled by Thich Nhat Hanh and the Monks and Nuns of Plum Village. Published by Parallax Press in 2000. Aware of the suffering caused by sexual misconduct, I am committed to cultivating responsibility and learning ways to protect the safety and integrity of individuals, couples, families, and society. Knowing that sexual desire is not love, and that sexual activity motivated by craving always harms myself as well as others, I am determined not to engage in sexual relations without true love and a deep, long-term commitment made known to my family and friends. I will do everything in my power to protect children from sexual abuse and to prevent couples and families from being broken by sexual misconduct. Seeing that body and mind are one, I am committed to learning appropriate ways to take care of my sexual energy and cultivating loving kindness, compassion, joy and inclusiveness -- which are the four basic elements of true love -- for my greater happiness and the greater happiness of others. Practicing true love, we know that we will continue beautifully into the future. Aware of the suffering caused by fanaticism and intolerance, we are determined not to be idolatrous about or bound to any doctrine, theory, or ideology, even Buddhist ones. Buddhist teachings are guiding means to help us learn to look deeply and to develop our understanding and compassion. They are not doctrines to fight, kill, or die for. Aware of the suffering created by attachment to views and wrong perceptions, we are determined to avoid being narrow-minded and bound to our present views. We shall learn and practice nonattachment from views in order to be open to others' insights and experiences. We are aware that the knowledge we presently possess is not changeless, absolute truth. Truth is found in life, and we will observe life within and around us in every moment, ready to learn throughout our lives. Aware of the suffering brought about when we impose our views on others, we are committed not to force others, even our children, by any means whatsoever -- such as authority, threat, money, propaganda, or indoctrination -- to adopt our views. We will respect the right of others to be different and to choose what to believe and how to decide. We will, however, help others renounce fanaticism and narrowness through compassionate dialogue. Aware that anger blocks communication and creates suffering, we are determined to take care of the energy of anger when it arises and to recognize and transform the seeds of anger that lie deep in our consciousness. When anger comes up, we are determined not to do or say anything, but to practice mindful breathing or mindful walking, and acknowledge, embrace, and look deeply into our anger. We will learn to look with the eyes of compassion at those we think are the cause of our anger. Aware that life is available only in the present moment and that it is possible to live happily in the here and now, we are committed to training ourselves to live deeply each moment of daily life. We will try not to lose ourselves in dispersion or be carried away by regrets about the past, worries about the future, or craving, anger, or jealousy in the present. We will practice mindful breathing to come back to what is happening in the present moment. We are determined to learn the art of mindful living by touching the wondrous, refreshing, and healing elements that are inside and around us, and by nourishing the seeds of joy, peace, love, and understanding in ourselves, thus facilitating the work of transformation and healing in our consciousness. Aware that great violence and injustice have been done to our environment and society, we are committed not to live with a vocation that is harmful to humans and nature. We will do our best to select a livelihood that helps realize our ideal of understanding and compassion. Aware of global economic, political and social realities, we will behave responsibly as consumers and citizens, not investing in companies that deprive others of their chance to live. Aware that much suffering is caused by war and conflict, we are determined to cultivate nonviolence, understanding and compassion in our daily lives, to promote peace education, mindfulness meditation, and reconciliation within families, communities, nations, and in the world. We are determined not to kill or let others kill. We will diligently practice deep looking with our Sangha to discover better ways to protect life and prevent war. Aware of the suffering caused by exploitation, social injustice, stealing, and oppression, we are committed to cultivating loving kindness and learning ways to work for the well-being of people, animals, plants, and minerals. We will practice generosity by sharing our time, energy, and material resources with those who are in need. We are determined not to steal and not to possess anything that should belong to others, but will try to prevent others from profiting from human suffering or the suffering of other beings. Aware that sexual relations motivated by craving cannot dissipate the feeling of loneliness but will create more suffering, frustration, and isolation, we are determined not to engage in sexual relations without mutual understanding, love, and a long-term commitment. In sexual relations, we must be aware of future suffering that may be caused. We know that to preserve the happiness of ourselves and others, we must respect the rights and commitments of ourselves and others. We will do everything in our power to protect children from sexual abuse and to protect couples and families from being broken by sexual misconduct. We will treat our bodies with respect and preserve vital energies (sexual, breath, spirit) for the realization of our bodisattva ideal. We will be fully aware of the responsibility of bringing new lives into the world, and will meditate on the world into which we are bringing new beings. This page updated July 1, 2017.